PLANET in PERIL, your "one-stop shop" for the truth about our planetary crisis. : Ottawa Dithers Over Health Concerns About "Roundup"
Ottawa Dithers Over Health Concerns About "Roundup"
Despite copious evidence that the globally-popular weed-killer may be harmful to crops, wildlife, livestock and humans, the Government of Canada seems in no hurry to act. Last June, Health Canada (the federal Department which regulates pesticides) told me, it was aware of such evidence, but, that, "It did not raise immediate risk concerns that would have triggered regulatory action." Then, in November, the Federal Court ordered the Minister of Health, Leona Aglukkaq, to reconsider a decision she had made in August, 2009. That's when she refused a citizen's request for a "special" review of the product. The Minister settled instead for a longer-range, routine re-evaluation. That didn't begin until some two years later and won't be finished for about another two. The court ruling came down almost three months ago. The Minister is still "reconsidering" whether to call that special review. 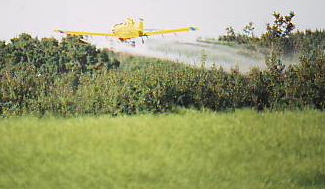 A "crop-duster" sprays a field in western MB. Ask most conventional farmers about Roundup, they'll tell you. 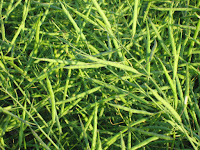 It's a chemical they spray regularly on their canola, soybeans, corn or, in some cases, sugar beets, to get rid of weeds. Sometimes, they also apply it in the fall to cereal crops like wheat and barley to dry them out, in preparation for harvest. The seeds used to grow the crops have been altered to resist Roundup, by adding a gene from another species. It’s called genetic modification (GM) or transgenics. These "genetically-modified organisms," (GMOs) allow the Roundup to kill the weeds, but spare the crops. Hence the term, "Roundup-Ready" (RR). In addition to food crops, forestry companies use Roundup (and similar formulations) to keep down unwanted weed growth which would otherwise smother re-plantings after clear-cutting. It is also used "cosmetically" on lawns and gardens to keep them free of such nuisance weeds as dandelions. Several provinces have already banned, or are considering a ban on the use of Roundup (and other chemicals) for these purposes. While these "cosmetic uses" are coming under increasing regulatory scrutiny, use of the product in agriculture and forestry is largely uncontrolled. Roundup has, for years, been the top-selling herbicide for Monsanto, the US-based company which makes it. It has also been referred to as Monsanto's "flagship" product and a key to its enormous commercial success. There are now almost 200 "copy-cat" formulations of Roundup under different brand names on the market. But Roundup, first registered in 1976, still dominates. And, it works. "RR" crops are, for the most part, clean and weed-free. But an examination of the research done into the safety of Roundup over the years, offers many disturbing glimpses into a product which achieves such pristine monocultures. The pilot of a spray plane (above) covered in a severe skin rash. Argentina has seen an explosion in plantings of "Roundup-Ready" soybeans in the past decade or so; 19 million hectares (47 million acres) in 2009 alone. This has meant a corresponding spike in the use of Roundup, to an estimated 200 million litres a year. Other countries in South America, including Brazil, have experienced similar upward spirals in soy production. Well over 90 percent of soybean crops have been genetically-modified and therefore require Roundup to succeed. Just over a year ago, a team of international experts published what was (for a scientific research paper), a surprisingly damning indictment, not only of glyphosate, but of the very wisdom and sustainability of government ventures into vastly-expanded soybean production. The study, called, "GM Soy. Sustainable? Responsible?" not only published results of research done by team members themselves, but summarized research done elsewhere. And it documented the findings of a commission conducted by the central Argentinian State of Chaco in 2010. The Commission found that, from 2000 to 2009, childhood cancer rates tripled in the town of La Leonesa and birth defects increased almost fourfold over the entire state. Those results corresponded with greatly increased spraying of glyphosate and other agrichemicals in the region during that period. Scientific studies referred to in the paper, cite an association between glyphosate and at least two kinds of cancer, multiple myeloma and non-Hodgkin's lymphoma, (NHL), a cancer of the blood. An increased rate of NHL had been repeatedly observed among farmers for years, suggesting an association between use of pesticides, including glyphosate and the risk of the disease. In laboratory tests, one team member, ‪Andrés‬ Carrasco of the University of Buenos Aires, found that glyphosate causes malformations in frog and chicken embryos similar to those in humans, at one-tenth the rate allowed in Argentina. In an obvious attempt to counter critics who claim that lab tests are really "engineered" scenarios which don't truly replicate real situations, Prof. Carrasco noted that "experimental animals share similar developmental mechanisms with humans." Another researcher, Dr Damian Verzenassi of the School of Medical Sciences at Argentina's National University of Rosario puts it this way. "One cannot keep thinking about human health as though it were unconnected with the health of ecosystems." Many authors have reported that in the past 30 years there has been a significant decline in amphibian populations in several different parts of the world. In 2005, a researcher at the University of Pittsburgh, Rick Relyea, carried out research which pointed the finger directly at Roundup. He concluded that the weed-killer "Can cause extremely high rates of mortality to amphibians that could lead to population declines." Prof. Relyea, with the University's Department of Biological Sciences, noted that earlier tests in the laboratory had already shown that the herbicide may be highly lethal to North American tadpoles. So he set up tests exposing three species of frogs, both larvae and juveniles, to Roundup, outdoors, in what he called "more natural conditions." After a single day, "the Roundup had killed up to 86% of the juveniles and, in three weeks, up to 100% of the larvae." While Canadian plantings of soybeans pale in comparison to Argentina's, they are growing rapidly. According to the Canadian Soybean Council, overall soybean production reached a new high of 1.5 million hectares (3.7 million acres) in 2010, an 8-fold increase over 1973.
in Canada is massive and has been growing since that crop came into widespread use on the prairies. 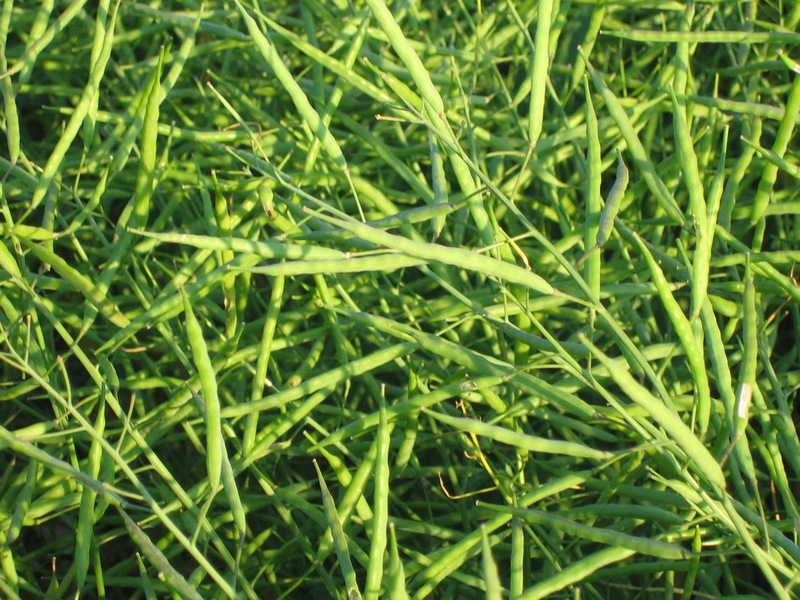 According to the Canola Council of Canada, seeded acreage grew, from 4% of total canola acreage in 1996 to 70% in 2000! And the goal of the Council is to boost canola production by 65%, to 15 million tonnes in the next three years! Actual figures on sales of Roundup itself are hard to come by in Canada. But, in Argentina, official figures show sales of the herbicide spiralled from one million litres a year in the 1990s to nearly 300 million litres today. Yet Canadian farmers don't seem to be buying into the horror stories emerging out of Argentina. Take Ron Gendzelevich, for example. He owns Quarry Seed on a 4,000-acre farm near Stonewall, Manitoba, north of Winnipeg. He describes his farm as an "experimental ground" where he sources hardy varieties of edible soybeans for northern climates and sells them. Some 80% are "Roundup Ready." Gendzelevich says, "I'm probably the first one to defend the environment." But, "For the most part, urban people just don't understand. GM has been given a monster terminology that just isn't justified in most cases. Given the number of people we have to feed, we've got to make and grow as much as we can. The bigger issue is world population. If we are going to allow it to grow unchecked, we have to boost production because, which is better, to have a slightly safer world, with people starving, or a very small degree of risk with people being fed? That's the bigger question." Gendzelevich adds, other farmers are using chemicals on other crops which are even more toxic than Roundup, including 2-4-D. "When I went to convert soybeans to RR, my Roundup use went up massively but my overall herbicide use went down dramatically. That's because you're dealing with a product that has the ability to kill weeds a little bit better. Before, you had to use 3 or 4 herbicides to do the overall same job as one can do and I think what you're finding is, you were putting a substantial amount more herbicides or chemicals on the ground in the olden days than today." The soybean producer admits he doesn't know a lot about the Argentine experience. But, "I see a person swigging whisky and smoking, talking about how farmers are poisoning the world, I don't take 'em with any respect. I'd like to see the evidence." A body of research done here in Canada seems to counter claims by Roundup's maker, Monsanto, that it is safe. 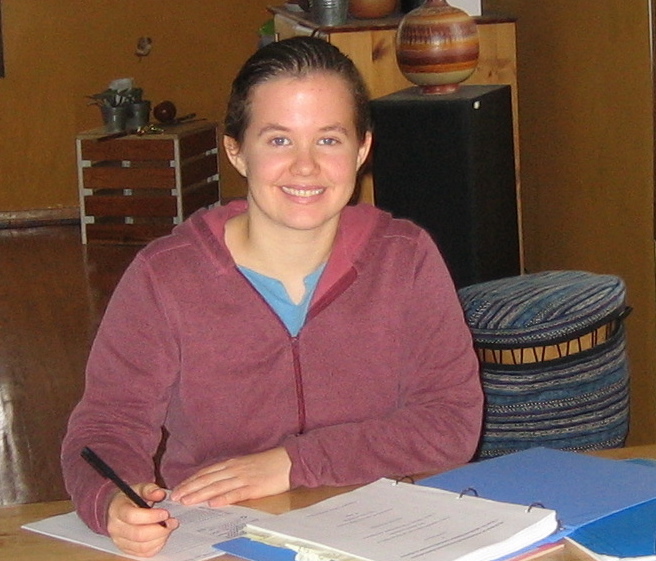 Five years ago, a graduate student at the University of Manitoba, Jennifer Magoon, (PinP photo, above) found statistically significant links between the use of crop sprays and serious health problems with infants born in farming areas of the province where such sprays were commonly used. Those problems included low birth weights, spina biffida, respiratory distress, jaundice, Down syndrome, cleft palate, retinal degeneration and cataracts. Her findings do not mention Roundup. But she singled out herbicides as the class of crop chemical she was most concerned with. In 1997, the Ontario Farm Family Health Study surveyed almost 19 hundred male farmers in Ontario who'd been exposed to several chemicals, including glyphosate in their faming activities. It concluded that their partners were "more than twice as likely" to miscarry or give birth, prematurely. In 2,001 another phase of the same study, surveyed almost 4 thousand pregnant farm women in the same province. All had been involved in farming activities, milking cows, cultivating or seeding the fields and sometimes helping their partners mix and apply the herbicides. 395 of those women experienced miscarriages. All had been exposed to a variety of pesticides, including glyphosate. In the words of the study, "Among older women (over 34) exposed to glyphosate, the risk of miscarriage was three times that for women of the same age who were not exposed to this active ingredient." In 2009, laboratory findings by a leading French researcher, Gilles-Eric Séralini, proved consistent with that Canadian research. In his lab at the University of Caen, the molecular biologist demonstrated that, within 24 hours, the active ingredient in Roundup, glyphosate, was totally lethal to three different kinds of human cells (umbilical, embryonic and placental), at just a fraction of the concentrations used in agriculture and equal to those found in human and animal feed! Séralini was "surprised" to also discover that other ingredients in Roundup, besides glyphosate, were not the harmless substances the public had been led to believe. On the contrary, Roundup, as a mixture, was, in every test, always twice as deadly as glyphosate alone! One of those other ingredients (polyoxyethylene tallow amines, POEA), stated the researcher, has been clinically shown to cause "high mortality in fish and amphibians." Regulators had been legally classifying "POEA" as simply "inert." He also concluded, Roundup's residues "May thus enter the food chain, and glyphosate is found as a contaminant in rivers." Séralini also concluded glyphosate is probably an "endocrine disruptor." According to the Environmental Protection Agency in the 'States, that means it can affect the human brain, nervous and reproductive systems, even blood sugar levels by disrupting the normal functioning of hormones in the human body, including estrogen and testosterone. Can Roundup (glyphosate) Actually Damage Crops? Extensive, multi-year research by an Agriculture Canada team led by Miriam Fernandez, published some two years ago, showed that use of glyphosate was actually a significant factor in the incidence of Fusarium head blight (FHB) and Common root rot (CRR) in wheat and barley crops planted up to 18 months after such application. Both FHB and CRR are considered serious diseases in these important cereal crops in places like eastern Saskatchewan, where the trials were conducted. (The study appeared in the European Journal of Agronomy in 2009.) While tillage practices were also found to have some effect, the team concluded, "Previous glyphosate use was consistently associated with higher FHB levels" … and "significantly increased" risk of the plant diseases. Can Fusarium Also Harm Animals and Humans? According to the Mold and Bacterial Consulating Laboratories, fusarium toxins "have been shown to cause a variety of toxic effects in both experimental animals and livestock and are also suspected of causing toxicity in humans. They also produce vomitoxin, which in turn results in a serious feed refusal and vomiting in animals fed contaminated feed." When is a "Court Order" not a Court Order? In November, the Federal Court of Canada heard a complaint launched by Josette Wier, an environmental activist from the north-central BC town of Smithers. She was the same person who had been turned down after requesting the Minister to conduct a special review in 2009. Under Canada's Pest Control Products Act, anyone may ask for such a review, which the Minister "shall perform, unless there is reasonable certainty that no harm will result from exposure to the pesticide." The applicant cited several studies already mentioned in this story, in documents she presented to the court. But during the proceedings, the judge, Mr. Justice Kelen, narrowed the case down to this: Were those herbicides, "Vision" and "Vantage," harming frogs and salamanders in "transitory wetlands" (ones which come and go), in clear cut areas where the forest has been directly sprayed and replanted? He found that there wasn't enough information on this potential aspect and that the Minister's 2009 decision was neither "transparent nor intelligible" in this regard. The court also found that Health Canada "erred in law" by arguing that a "special review" was not needed because the routine re-evaluation was underway. The judge found that it does not have to be one or the other - both are allowed to "co-exist" under the legislation. He found further that a special review could be both "targeted and possibly quicker" than the re-evaluation. Despite its seemingly decisive tone, the ruling isn't really binding, at all. As Andrew Baumberge of the Federal Court explains, "The Court is not meant to make the decision in the place of the federal government office/official"
At the time of this writing, some 11 weeks after the judgement, a spokesperson at Health Canada says the Minister, Leona Aglukkaq (l.) is still "reconsidering" the matter. The individual who started it all, Ms. Wier, refuses to accept it as a defeat. "The ruling is only a small victory, but a victory, nevertheless. In the 10 (?) years that the Act has been in place, I believe only one special review has been conducted. "I truly feel that I am doing the job of government and that government has become the enemy. Scientific facts mean nothing, as they are so embedded with industry and Monsanto, Dow Chemicals etc... are so powerful. "So only what is left is this awful job going through the court and wasting enormous amounts of time and money. I guess if changes are to happen, one should not expect any result soon, even in one's lifetime. But what counts is to keep the flow going." PinP: Ms. Wier needs to be commended for her efforts. While her campaign appears to be in limbo for the moment, she has exercised her democratic rights under the Act and gotten the Federal Court to support her! Make no mistake! That is a win! Now, perhaps other individuals can follow her example and hold the feet of the politicians and bureaucrats to the fire, to do what is right for our health and our environment. But, it also seems clear, if lessons are to be learned from all of this, sadly, not many appear to have sunk in. A recommendation from that student researcher, Ms. Magoon, for example, to reduce pesticide use, seems to have been largely ignored. GM soybeans continue to be hailed at agricultural events in Canada as the "Cinderella crop" of the future. Even provincial Departments of Agriculture continue to act more like agents for Agribusiness than advocates for farmers or consumers. Government crop specialists who write regular articles in the newspaper, frankly, cannot be counted upon to relay the kind of information contained in articles like this. Instead, they simply advocate business as usual - holding out the promise of GM crops and continued reliance on crop sprays as the only option for the future. One bright spot has been a growing movement by provinces to ban the use of such products on lawns and gardens. Manitoba will become the latest of several to do this, over the strong objections of conventional farmers and the organizations which represent them. I am going to make some copies of this article and distribute them. Excellent article, Larry. Many thanks! I will find time, sometime, to post the information that adds to your documentation of the corruption of the PMRA (Pest Management Regulatory Agency, Health Canada). They work for the Corporate interest, not to protect Health. Just one example: they put Dr. Keith Solomon from the University of Guelph on the review panel that made the decision about 2,4-D. He was “for hire” by the tobacco industry before he became a paid “professional” for the chem-biotech corporations. In the 1990′s he came to Regina on his own dime, out of the goodness of his heart (ha!) to speak against the introduction of a cosmetic pesticide by-law there. Thanks Larry! Excellent article, as always. I do so wish more people could see how Big Ag and government are killing the earth.